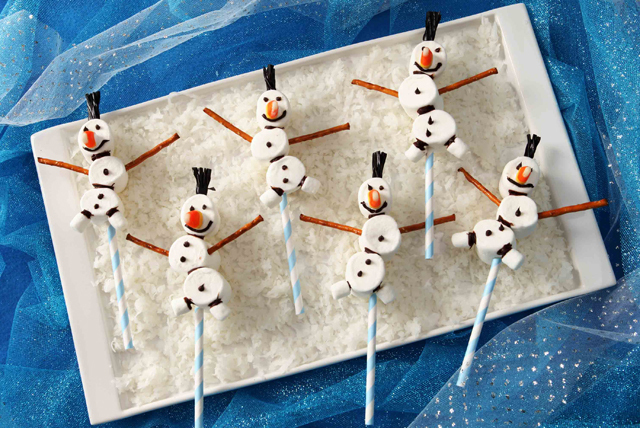 These wonderful winter snowman marshmallow treats couldn't be cuter—or easier to put together. Place 3 regular marshmallows on work surface; spread small amount of melted chocolate between marshmallows to secure. Starting at one end, insert straw through marshmallow stack to secure. Repeat with remaining regular marshmallows to make a total of 12 stacks to resemble 12 snowmen. Use toothpick to poke 2 holes into opposite sides of centre marshmallow in each snowman; insert pretzels into holes for the arms. Add 2 miniature marshmallows to bottom of each snowman for the feet, securing with small amount of the remaining melted chocolate. Cut licorice into small pieces for the hair. Spoon remaining melted chocolate into resealable plastic bag; cut small hole in one bottom corner of bag. Use to decorate snowmen as shown in photo, securing hair and candy corn noses to snowmen with remaining chocolate. Substitute lollipop sticks for the straws.